During the filming of our soon to be released segment for the PBS show Behind the Scenes, we also got the opportunity to film our first television commercial to be featured in several markets around the United States. We recently finished the rendering of this commercial and wanted to share with our audience four things we love about this video that are alluded too but not spelled out in the general information provided in this 30 second spot. The filming crew did a great job of capturing our Vanguard printer at work creating signs for Peach Smiles. One thing that set our team apart from many print shops in the various equipment that we have in house to help turn your product around quickly by our own crew. The commercial helps our clients and future clients put a face with a name. For many of our clients, we communicate via email and phone. It isn’t often that they get to see our designers out in the field or stop by the office to have a one on one conversation with some of our staff. 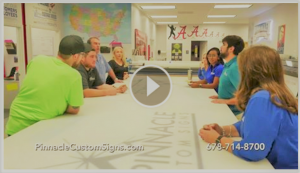 Although we are a family run business, the extended work family goes a long way in ensuring the success of Pinnacle Custom signs. This video really frames up the way we have team meetings around the project table each day. Phone calls, graphic design, production, and installation are all covered in this 30 second segment. Each job at Pinnacle goes through the process of client interaction, design and proof process, production, and then onto installation of graphics or signage. Although each detail isn’t captured completely, the entire process is referenced in under a minute. Our work-space is on full display for the rest of the world to see in this video, and clearly displays a few things about our personalities. Those University of Alabama “A’s” are in full view during the shot that doesn’t leave many people guessing that we are college sports fans. The bright wall graphics scattered throughout out show we take advantage or our graphics skills in our own work-space. In addition, it captures our capacity to work on multiple vehicles at a time in our shop area that produces high class vehicle graphics and wraps. Our company has grown beyond the borders of the Atlanta market in recent years to sign projects for clients across the United States. However, we continue to focus on maintaining the core concepts of customer service and providing a local touch to each project regardless of mileage. We know how important business signs are to your business. They represent your brand and your image to your customers. We also know that we are honored to awarded your trust in creating signage that represents your brand. To keep that trust, we have to continue to honor what has made us successful in the past and scale that service on the larger level. 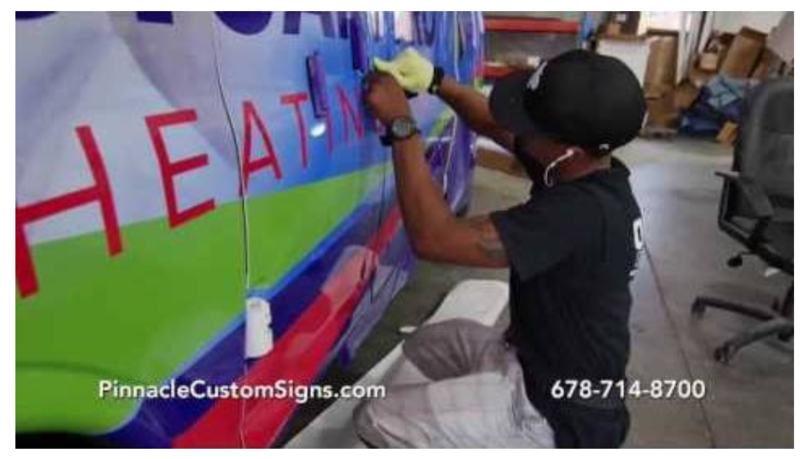 From business signs, trade show displays, vehicle graphics, office signs, outdoor signs and more, Pinnacle Custom Signs provides you the expertise to create striking custom signs to bring attention to your business. We continue to add trained staff and grow our skills to not only enhance what we offer to new clients, but increase our deliver-ability and services to our existing client base. “If you can think it, we can do it” is not only stated in the commercial but it’s true. We have clients ask us all the time if there are ways for us to do things like create a matching car tag, design tradeshow displays that end up becoming standing billboards, use custom hardware, or create something that looks similar to something else. So if you have something in mind, give us a call. We can tell you how it can be done.